Citizens has implemented more self-service features for policyholders, as explained below. First named insureds who are not registered for myPolicy now can update their phone number and email address via a link on the Contact Us and the myPolicy pages of the Citizens website. To update, they must enter specific policy information as it appears on their Declarations page or Policyholder ID Card. Note: Existing myPolicy users must contact their agent to submit changes to this information. Citizens will mail a letter to the first name insured, confirming the phone and/or email address update. Their agent will receive a notification activity in PolicyCenter® with the subject Contact Information has been updated for Policy xxxxxxxx, which will display for 60 days. A policy note will be added about the update. 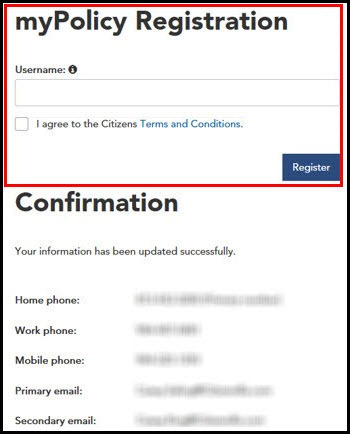 As part of this new feature and to promote use of myPolicy, Citizens has added a myPolicy registration option to this process. After a first named insured selects Yes to the myPolicy inquiry on the second Update Contact Information screen, they will be able to create their own myPolicy username in the screen that follows. To communicate this new process and to encourage myPolicy registration, Citizens will send letters in the upcoming months to myPolicy nonusers with no email address on file or whose email addresses are incorrect. Log in to the Agents site, and from the website’s top menu, select Search → Search Frequently Asked Questions (FAQs), and enter myPolicy. Search returns include the myPolicy Overview for Agents job aid. 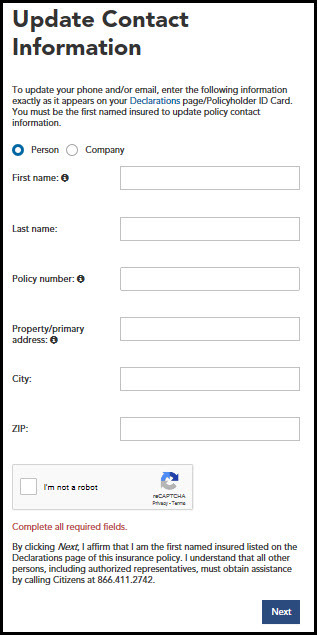 Policyholders can search frequently asked questions (FAQs) by selecting the Frequently Asked Questions link on the right side of the myPolicy Login page and using the keyword myPolicy.